History Schmistory: February 20. Hofer heaven’s sake! 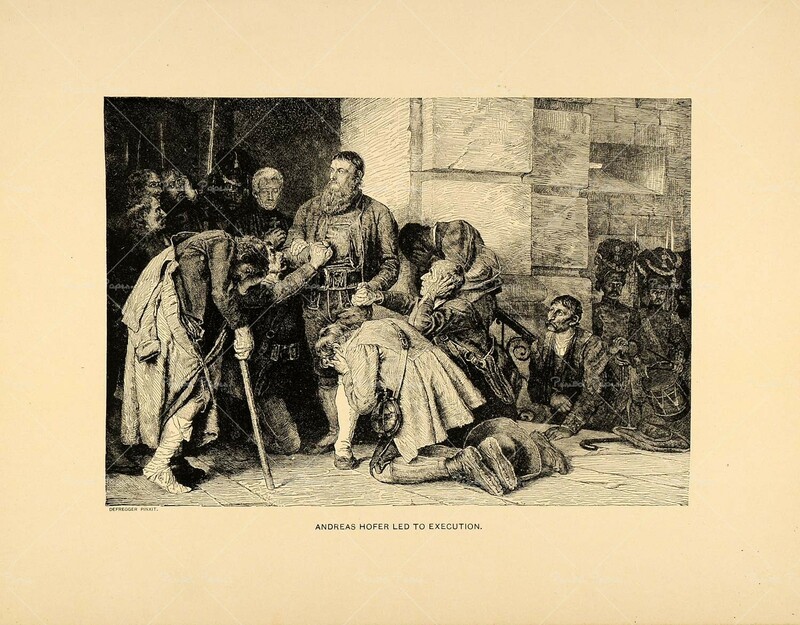 1810: Andreas Hofer, a humble Tirolean innkeeper turned patriot, who became the leader of a rebellion against Napoleon’s forces, is executed by firing squad under Napoleon’s order to “give him a fair trial, then shoot him.” Hofer refused a blindfold, passing money to the corporal with orders to “shoot straight”. In his final letter Hofer proclaimed; “Goodbye disappearing world! Dying is so easy that my eyes have no tears.” Today he is regarded as a national hero in Tirol and much of Austria and Germany. 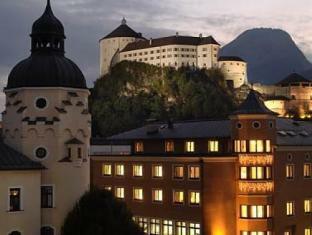 Even has a four star hotel named after him. As a former innkeeper, he probably would appreciate that. History Schmistory: January 25. She’s Baaaaaack! 1890: Renowned journalist, Nellie Bly completes her round-the-world journey in record time, beating Jules Verne’s prediction from his famous novel Around the World in 80 Days. 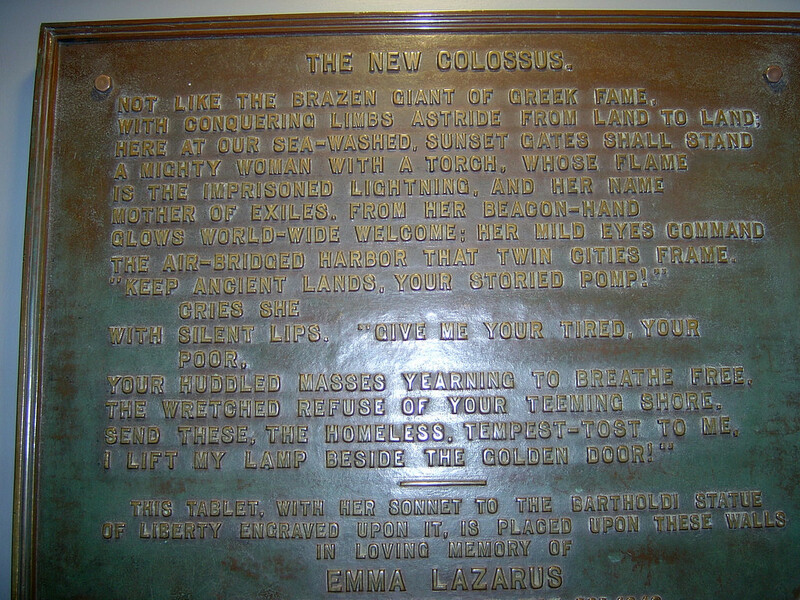 History Schmistory: October 24. Steel Widow. 1901: With her only child dead and her only husband killed in the Civil War, aging schoolteacher Annie Edson Taylor feared she was destined to end up in the poorhouse. But then she came up with a brilliant plan. 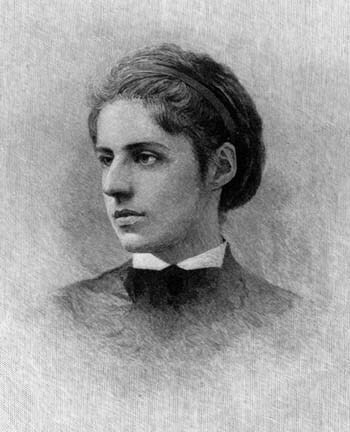 First, she would pay professional coopers to construct a heavy duty, elongated and well-cushioned barrel. Then, on October 24th, her 63rd birthday, she would climb inside and ride it over the edge of Niagara Falls, a feat that would hopefully bring enough publicity and wealth to carry her comfortably into senectitude. The stunt is a resounding success, and Annie becomes the first person ever to accomplish it, emerging from the certain-death-capsule with only a small gash on her head, though she made it clear she would rather “walk up to the mouth of a cannon” than ever try it again. Unfortunately, the story ends with Annie spending most of her earnings on private detectives in a futile search for the missing barrel, no doubt sold by her concurrently absent manager. 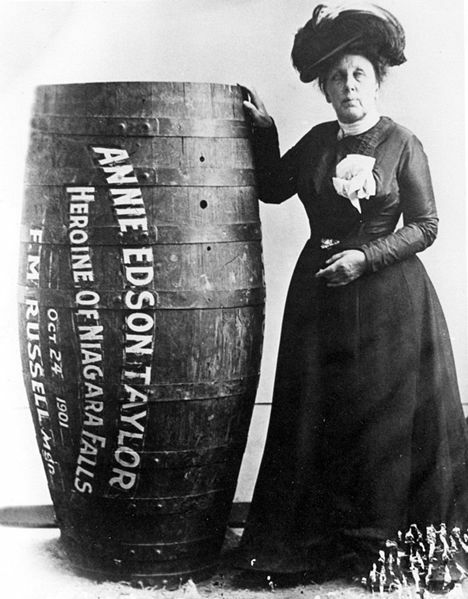 Still, Annie Edson Taylor remains one of the most gutsy people in the history of daredevilry. History Schmistory: October 6. Around the World in 4,833 days. 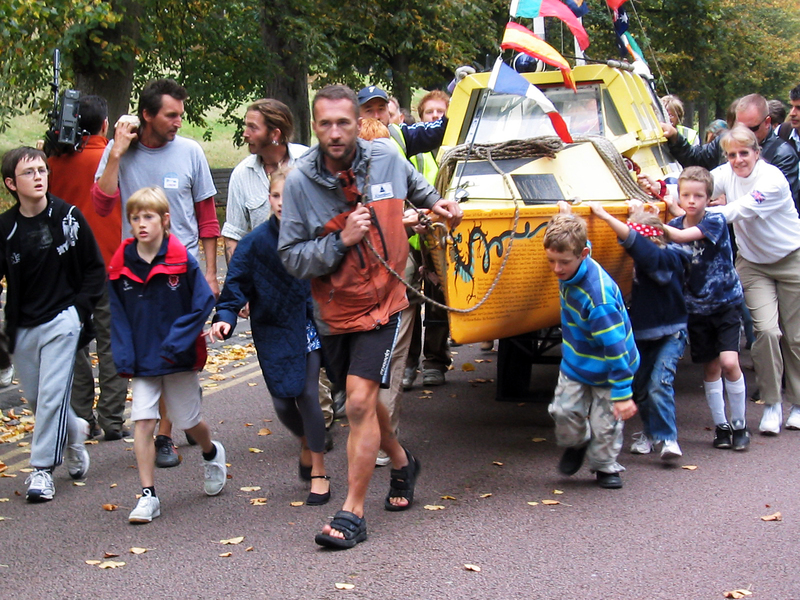 2007: Modern day adventurer, Jason Lewis completes his human-powered circumnavigation of the globe, having hiked, biked, roller bladed, kayaked, swam and pedaloed his way around the entire planet! The trip was supposed to take around 3-4 years, but he had a few hang ups, like capsizing in two oceans, going to jail, being robbed at machete point, breaking both of his legs, dodging the bullets of a civil war, and being attacked by malaria, blood poisoning, altitude sickness and a crocodile, just to name a few. All told, when reaching his original starting point, Jason Lewis had traveled nearly 46,000 miles in 13 years. As far as we’re concerned he deserves a lifetime lazy-pass. Though he probably wouldn’t even use it. 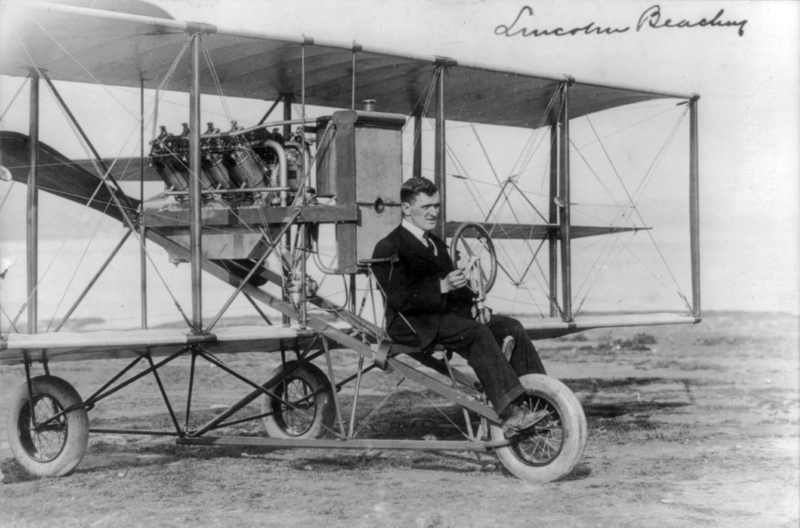 As an executive officer of the US Signal Corps, George Owen Squier helped the Wright brothers with their first airplane, and was even its first passenger. 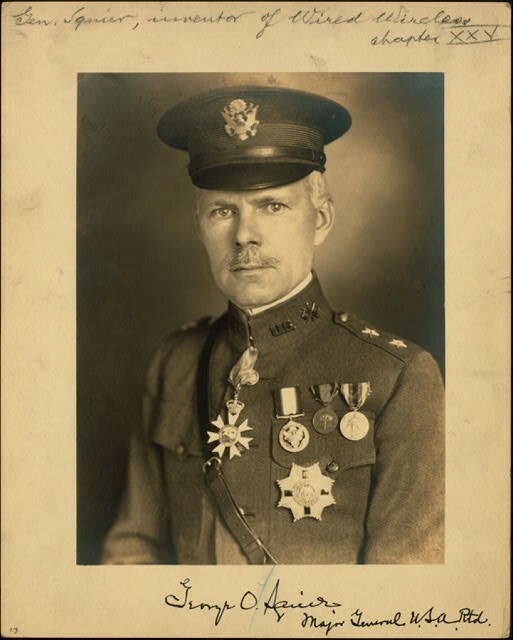 From there, he secured the first purchase of US military planes, launching a new ‘Aeronautical Division’ for which he was Major General during WWI. But that’s not even the coolest thing he’s done. George was also a wizard with electricity and radio technology, holding over 60 patents to his name. He invented multiplexing, which allows multiple signals to be transferred at once through a single wire, paving the way for new possibilities in telecommunication. 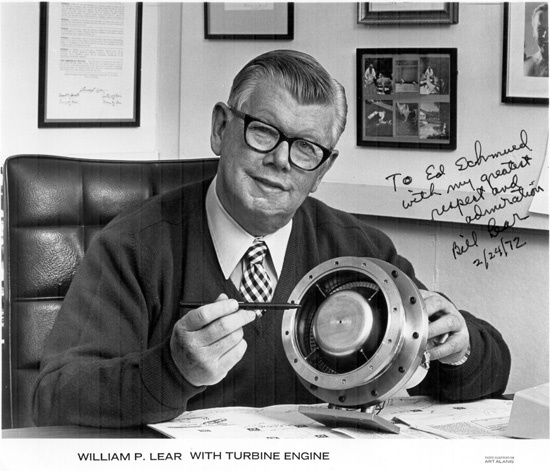 He invented wired radio, or as he called it, “wired wireless”, as a replacement for the unreliable home radios of the era. Though it never became a household commodity in his time, (any of us with cable TV certainly owe him a tip o’ the hat) George wasn’t deterred by this minor setback. Instead he convinced businesses that piping music through their establishments would increase sales and productivity. He was right. Soon businesses across the US were playing music not through a single radio in the corner, but in several locations throughout their sotres and workshops, thanks to wired radio. His name for this new technology? 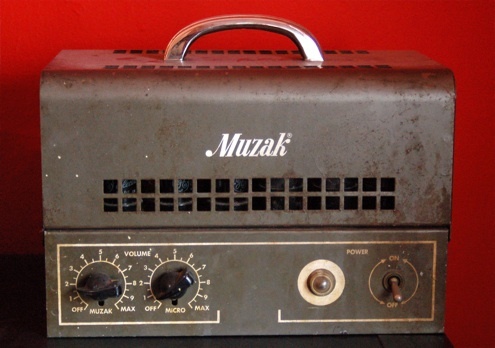 Muzak! That’s right, George Owen Squier is responsible for that cheesified version of Goodbye Yellow Brick Road you can never seem to get out of your head… Well he was still pretty awesome. 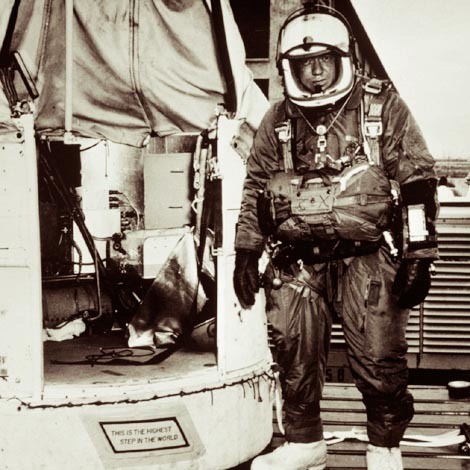 1984: Joseph Kittinger becomes the first man to fly solo across the Atlantic Ocean in a hot air balloon. At 56 years old, it is only his latest of a lifetime of accomplishments, which include setting the record for the highest, longest and fastest skydive, and surviving a year in a North Vietnamese POW camp. Nails, folks. Nails. 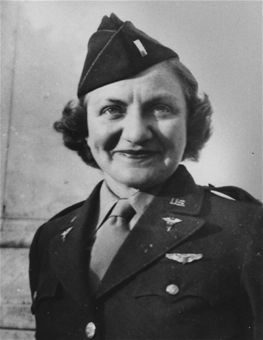 1st Lieutenant Aleda E. Lutz was an American army flight nurse who flew an unprecedented 196 missions during World War II, totaling over 800 hours, evacuating over 3,500 injured men to safety from the battlefront. During her 196th mission she became the first military woman to die in a combat zone. Hey HBO! There’s a mini-series for ya! You’re welcome.